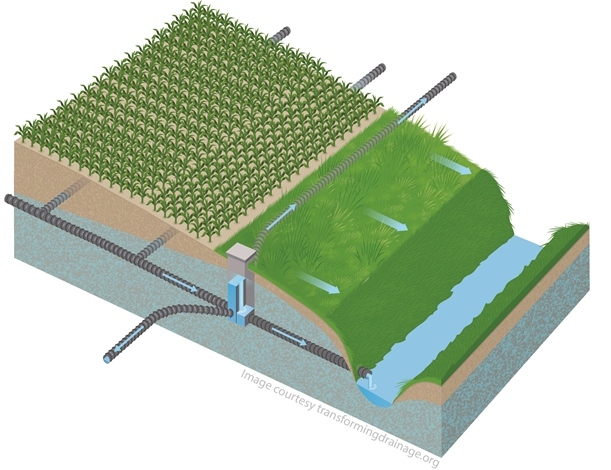 Saturated buffers store water within the soil profile of field buffers, by diverting tile water into shallow laterals that raise the water table within the buffer and slow outflow. Early results for saturated buffers indicate that they can be very effective at removing nitrate from tile drain water before it is discharged into surface waters. Saturated buffers could also help reduce the peak flow in streams, acting as detention structures that delay discharge and flatten the stream hydrograph, although little research has occurred on their potential ability to temporarily store water. The Transforming Drainage project brings together research from experimental saturated buffer sites across the U.S. Midwest to evaluate the full potential of this new and exciting practice, and develop tools and resources that will help farmers, drainage contractors, conservation staff, and others locate, design, and install saturated buffers within tile-drained landscapes. 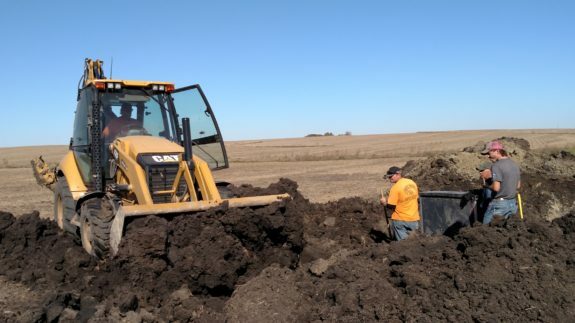 Quantifying the Effectiveness of Installing Saturated Buffers on Conservation Reserve Program to Reduce Nutrient Loading from Tile Drainage Waters. 55 page report by Jaynes, D. and F. Brooks. Agricultural Drainage Management Coalition. FSA Contract: AG-3151-P-16-0225. Apr. 2017. http://www.saturatedbufferstrips.com. Quantifying the Effectiveness of Saturated Buffers to Reduce Nutrient Loading From Tile Drainage Waters. 39 page report by Kult, K. Agricultural Drainage Management Coalition. FSA Contract: AG-3151-P-17-0164. Nov. 2018. http://www.saturatedbufferstrips.com. Demonstrate and Evaluate Saturated Buffers at Field Scale to Reduce Nitrates and Phosphorus from Subsurface Field Drainage Systems. 215 page report by Utt, N., D. Jaynes, and J. Albertsen. Agricultural Drainage Management Coalition. 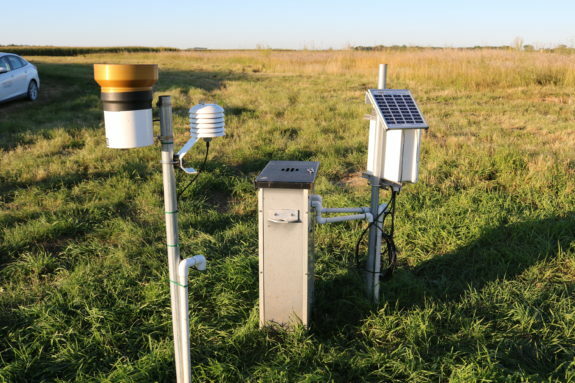 NRCS Conservation Innovation Grant: 69-3A75-11-205. FSA Contract: AG-64SS-P-12-0051 and AG-3151-P-15-0168. Dec. 2015. http://www.saturatedbufferstrips.com. Saturated Buffer Plan for MU Greenley Research Center. Ecosystem Services Exchange. 2017. Greenley Memorial Research Center Field Day Report. Ag Drainage Water Management Webinar Series. (1 hour webinar showing slides) Jaynes, D. Oct. 21, 2015. ACPF Watershed Database Saturated Buffer Viewing Tool. 2017. An online mapping application identifying potentially suitable areas for the saturated buffer practice. Jaynes, D, M. Tomer, D. James, and S. Porter. USDA-ARS. New Saturated Buffer Publication Available. Iowa Soybean Association (2018) — Nov. 2018 article describing saturated buffers and its growing popularity. Brown, C. Iowa Soybean Association. 2018. 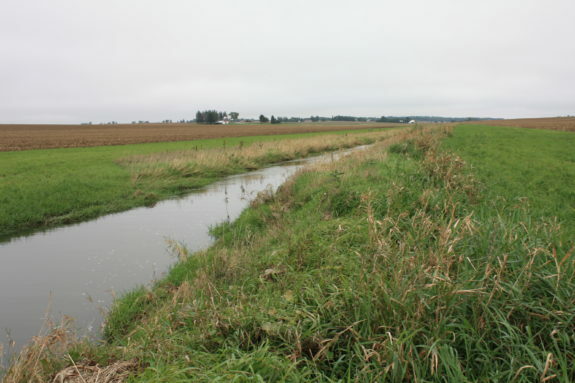 Buffer strips key to reducing nitrates in Iowa water. The Des Moines Register (Apr. 12, 2015) — Article including raph and anecdotal evidence of buffers’ effectiveness. Getting Iowa farmers to embrace the C word. Des Moines Register (Sep. 14, 2016) — Article discussing cover crops and lawsuits pertaining to it. 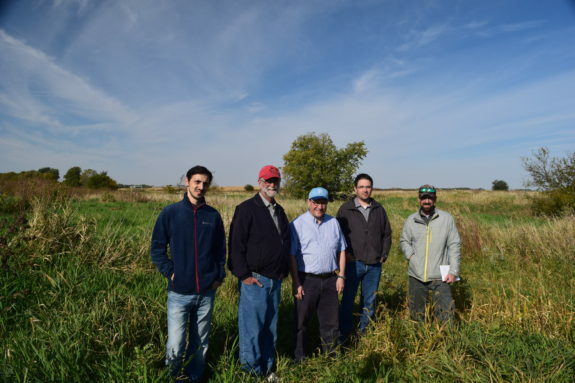 Iowa State University Advances Saturated Riparian Buffers as a Promising Water-quality Practice for Crop Fields. 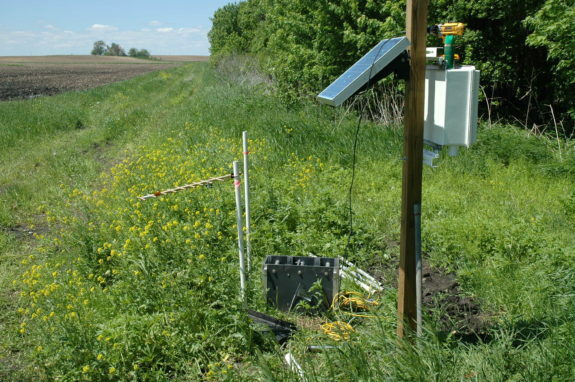 Iowa State University College of Agriculture and Life Sciences (2018) — Article describes saturated buffers implementation and the effects it has on nitrogen levels among other metrics. Negligible nitrate escapes. Farm News (Mar. 20, 2015) — Report on statistics of buffers’ effectiveness on nitrate levels. New Tool Cheaply, Efficiently Captures Nitrates. Successful Farming Magazine (Nov. 5, 2015) — Focuses on cost benefits that saturated buffers provide. Saturated buffers enhance on-farm conservation efforts. Corn and Soybean Digest (Mar. 24, 2016) — A full-length article describing where saturate buffers proved to be effective and how to select an optimal site. Saturated buffers do reduce nitrates from subsurface field drainage systems. AgriMarketing (Jul. 20, 2016) — Article with cost benefits and image of a saturated buffer system. This Easy Fix is How You Stop Poisoning the Fish in the Gulf of Mexico. NationSwell (Mar. 28, 2016) — Article focuses on the environmental impacts of saturated buffers. 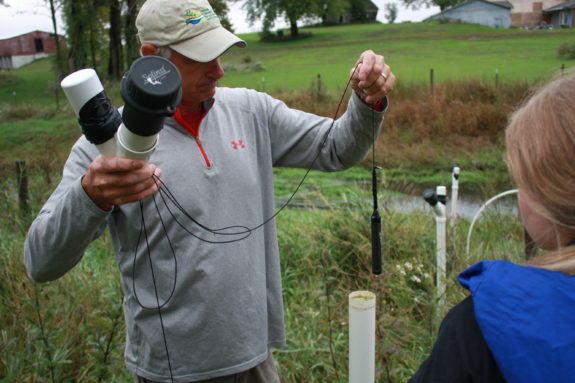 Capturing Nitrogen: Research is establishing installation guidelines for buffer strips. Drainage Contractor (Nov. 2017) — Interactive magazine featuring images courtesy of Transforming Drainage. Iowa Soybean Association assisting with Bioreactors and Saturated Buffers. Mitchell County Press News (May 4, 2016) — Describes concept of bioreactors in addition to an overview of saturated buffers. Conservation Q&A: Saturated Buffer. Iowa Farm Bureau (Aug. 25, 2015) — YouTube video going over the concept of saturated buffers. 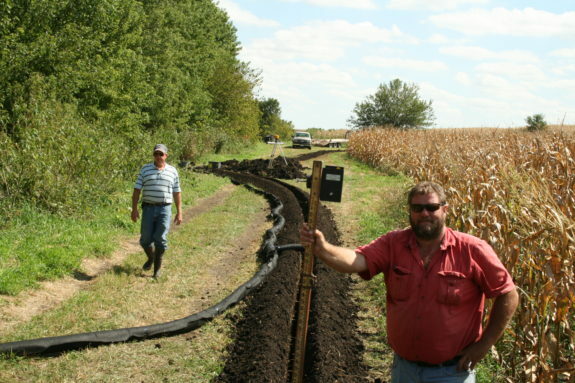 Saturated Buffers: A nutrient removal option for farmers. Conservation Districts of Iowa and the Soil and Water Conservation Society (2017) — YouTube video from Transforming Drainage including videos of sites utilizing saturated buffers.